Find out if you have symptoms of poor fat digestion, why fat digestion is so important to your health, and what to do about it whether or not you have a gallbladder. If you’ve read the first article in this series on digestion, So you have some digestion problems—what’s the big deal?, you would have learned that certain steps in the digestion process need to occur in order to digest fats. 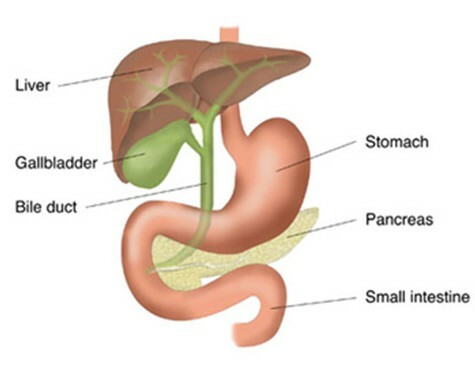 Sufficient stomach acid makes the food in the stomach entering the small intestine acidic enough to trigger the release of more digestive enzymes from the pancreas and bile from the gallbladder. One of those digestive enzymes, lipase, also helps break down fats. Bile is a substance made in the liver and stored in the gallbladder. One of its jobs is to break down fats. If there is not enough stomach acid, the food will not be acidic enough to trigger the release of those digestive enzymes and bile to digest fats. It is in this way that low stomach acid leads to the breakdown in the digestion process further on. You can read more about this in the second article in the series, Stomach acid IS good for you! Thus those with low stomach acid often have poor fat digestion. Bile is made in the liver using cholesterol and fats, and then stored in the gallbladder. When acidic food with fat is present in the small intestine, the gallbladder gets the signal to squeeze out the bile. It travels down the common bile duct into the small intestine. Healthy bile is thin and can flow easily from the gallbladder through the common bile duct to the small intestine to digest fats in the food. Unhealthy bile is thick and viscous so cannot flow easily. How does the bile get to be thick and viscous? The causes of poor bile flow include a poor-functioning liver, low stomach acid, and a low-fat or poor-fat diet, among other things. If there is not enough stomach acid to trigger the release of bile, that healthy bile will become stagnant and thick. When there is enough stomach acid (or stomach acid replacement from a supplement), the bile will get the message to flow but won’t be able to because it’s too thick to flow properly. Another way bile can become too thick is from eating a low-fat diet or diet with unhealthy fats (highly processed vegetable oils or hydrogenated fats). Bile is made up of healthy fats and cholesterol. Without such ingredients, the liver cannot build healthy bile. Also, fat in the food itself triggers the release of bile. Without enough fat in the diet, the bile will not get that signal and will remain stagnant and become thick in the gallbladder. So if one starts eating more fat than usual, they may get stomach upset from eating that fat because their bile just can’t digest it. Why is fat digestion so important anyway? Animal and vegetable sources of fats are required for optimal health. What happens when we don’t digest our healthy fats? Even if we eat healthy fats, we cannot enjoy optimal health if we can’t properly digest them. Moreover, poor fat digestion can also harm our health. Partially digested fats, proteins and carbohydrates can contribute to leaky gut. Leaky gut is a condition when the walls of your small intestines are too permeable. When undigested proteins from food cross the leaky gut into the blood stream, they look foreign to the immune system. The immune system then attacks these proteins as a safety precaution. Over time, with other contributing factors, this reaction may lead to expression of an autoimmune condition—when our immune system misperceives its own tissue as a foreign invader and attacks it. Leaky gut is not only a necessary precursor to autoimmune disease (Hashimoto’s thyroiditis, ulcerative colitis, Crohn’s disease, etcetera) (Ballantyne 53), but also neurological illnesses, including Alzheimers, autism, ADD, depression, bi-polar disorder, schizophrenia, and anxiety (Campbell-McBride), chronic pain (source), skin problems like eczema or psoriasis (Lipski 43) among other conditions. Reversing these conditions requires “sealing” the gut wall and restoring the gut flora. Under the supervision of a Nutritional Therapy Practitioner like us or a functional medicine health care practitioner, you can take a supplement that supports the liver to make healthy bile and helps to thin the existing bile. You may also take a bile replacement called ox bile for 2 weeks before switching to the first supplement. Ox bile is the bile of oxen. Temporary side effects when starting to use ox bile: Old bile gets flushed through and you may have more loose stools and eliminate frequently for three to five days. You may see undigested fats in stools until the bile thins out and is able to thoroughly emulsify fats in the diet. Another typical healing reaction is a little nausea. Also, with healthier bile, the liver is able to better re-circulate toxins and the toxins come out through the skin, causing acne. If you have a gallbladder and you find you need the supplements long-term, then there is an underlying issue that needs to be addressed, likely the liver. Take high quality coconut oil in addition to taking a supplement to support healthy bile production. Coconut oil provides the fats needed to make healthy bile but does not require bile itself for breakdown. Take 1 tablespoon coconut oil in the morning before eating and mid-day in between meals. (This also helps with blood sugar regulation, maintaining even energy levels, and helps to curb cravings for carbs and sugar). Coconut oil, like butter, does not get converted to fat on your body! (Enig 31)). Make sure you have enough stomach acid. See this article Stomach Acid IS good for you for more information. Stomach acid is needed to make the food acidic enough to signal the gallbladder to release bile into the small intestine. Eat healthy fats such as organic full-fat pastured dairy (not pasteurized milk though! ), pastured eggs, avocados, wild seafood, organic pastured ghee, pastured animal fats (alone or in the meats), organic pastured butter, and olive oil. Such healthy fats help make healthy bile and signal the gallbladder to squeeze out the bile when needed to break down fats in the food. If you have been eating a diet low in fat or full of unhealthy fats, you will need extra support to thin out that bile. Coconut oil does not require bile for breakdown. If you have a gallbladder, you may need to take bile support supplement for a while before starting to eat healthy fats. Eating healthy fats alone will likely not be sufficient to make healthy bile. If you like home remedies, you may try eating raw beets (grate them onto your salad) or beet kvaas one to three times a day. Again, this alone will not likely be sufficient to make healthy bile. Just because you have your gallbladder removed does not mean you can never digest fat and you need to stick to a low-fat diet. Without a gallbladder to hold the bile, bile continually drips from your liver through the common bile duct into your small intestine. The problem is that when you need bile to digest the fat in your food, you don’t have enough of it at one time. If you have no gallbladder, you will likely need to take a bile replacement for the rest of your life. This replacement is called ox bile, which is the bile of oxen. The supplement should also include the digestive enzyme lipase (which may come from another animal like pigs). Those without a gallbladder can eventually reduce the amount of bile replacement after a couple of years. You may still need to take on a daily basis, but not at every single meal. As the constant drip of bile into the small intestine when there is no food can be hard on the small intestine, you will need to heal the lining of the small intestine continually. You can follow steps 2, 3, 4 and 5 above. However, do not add more healthy fats into your diet until you are taking a bile replacement. You may take Swedish bitters or bitter herbs like dandelion, sarsaparilla and milk thistle to support healthy bile production, but such herbs can never make the quantity of bile needed to emulsify fats. Work with a Nutritional Therapy Practitioner like us or a functional medicine health care practitioner to find a bile replacement that works for you while addressing the underlying reason for having your gallbladder removed in the first place. And lastly, if you and health care practitioner cannot resolve your digestion problems, find one who can. Digestive issues do not resolve on their own but only get worse. Don’t delay feeling better. Contact a nutritional therapist like us or find a functional medicine practitioner through the Institute for Functional Medicine. As always, feel free to leave a comment or question! Ballantyne, Sarah. The Paleo Approach: Reverse Autoimmune Disease and Heal Your Body. Las Vegas: Victory Belt Publishing, Inc, 2013. Enig, Mary G. Know Your Fats: The complete primer for understanding the nutrition of fats, oils and cholesterol. Silver Spring, MD: Bethesda Press, 2000. Lipski, Liz. Digestive Wellness: Strengthen the Immune System and Prevent Disease Through Healthy Digestion, 4th edition. New York: McGraw Hill, 2012.